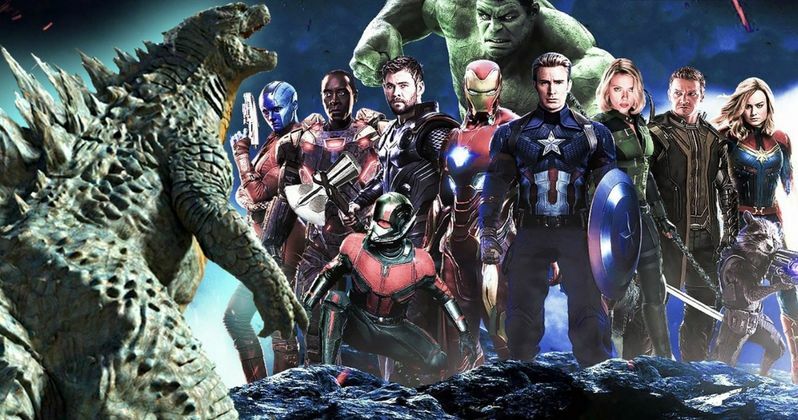 King of the Monsters director Micheael Dougherty would love to see the force of nature Godzilla taking on the superhero team The Avengers in a movie franchise crossover. I am sure that would make an epic battle for all to see, but it will probably remain in the realm of our minds for now. Godzilla may be King of the Monsters, however the Avengers along with the other Marvel heroes have been dominating the box office for the past decade. Disney's MCU with the release of Captain Marvel has topped over 18 billion dollars in gross revenue worldwide. Naturally other moviemakers will try to copy such a successful formula so they too have started their own universes to get their share of the worldwide movie market. In the Warner Bros. attempt to create a universe of their own they are using their famous monsters to create a Monsterverse, a universe that includes Godzilla, King Kong, Mothra, King Ghidorah, and Rodan. Making a real time film that would include the Avengers fighting back Godzilla would be incredibly challenging, but drawing a comic seemed to be doable back in the late 70's. During that time Marvel had acquired the licensing rights to make a Godzilla comic book series starring the nuclear waste born monster. They did indeed draw several scenarios which include Godzilla getting blasted by the Avengers. The rights have since gone to other comic publishers like Dark Horse Comics and IDW Publishing. Dark Horse has handled so many HUGE characters that I am sure they could draw an awesome update to the retro 70's comic series. In a tweet, Michael Dougherty, the director of the new King of the Monsters film, jokes about seeing a classic Marvel comic made into a movie: Godzilla #23. Dougherty, in the tweet, sent out a picture of the cover of the vintage comic jesting "This movie would make the world a better place." Apparently fans agreed with him as they posted many a page from the old Godzilla comics in the replies to Michael's tweet. Godzilla didn't stay around in the Marvel Comics universe for too long, but then again, Godzilla is known to never really stay in one place too long now is he? Back during that time in his life, when he was a comic book hero, the giant lizard encountered many a Marvel legend: The Fantastic Four, Hercules, Dum Dum Dugan and Devil Dinosaur. The biggest clash came though, in between the pages of the very comic cover Dougherty tweeted to fans. Godzilla off on one of his blind rampages is wreaking havoc everywhere, so earth's mightiest heroes get the call to come help curb the damage. Godzilla soon clashes with the Fantastic Four and the Avengers team consisting of Captain America, Iron Man, Thor, Hank Pym, Wasp, Vision and Scarlet Witch. You would think with all that superhero fire power the team could stop Godzilla, but not the case. In the end, the hero turns out to be a young Japanese boy who convinces Godzilla to quit fighting. The giant lizard takes the young boy to heart leaving behind the wreckage he created, descending back into the ocean for another long slumber. Godzilla will return in Godzilla 2: King of the Monsters when he arrives in theaters on May 31st. This comes from Mike Dougherty's Twitter.